It is exotic fishing in Alberta's Rocky Mountains, where you can savour wide-open spaces, breath-taking scenery and utter solitude. Your attitude shifts with the altitude, bringing your appetite for fishing up a few pleasurable notches. Crystal clear streams flow through valley bottoms. Unspoiled wilderness flanks the riverbanks. Big game is never far away. 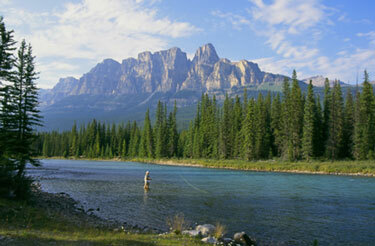 Soaring mountain peaks compete with bountiful fish for anglers' attention. And there's not another fisherman – or fisherwoman – for miles. All these facets of fly fishing the Canadian Rocky Mountains Rockies ensure an unparalleled North American fishing experience. Fishing licenses, which come in a variety of time frames, are both inexpensive and readily available. Whether you're drawn to the great fishing in the meandering Upper Bow River, the solitude of remote streams around Crowsnest Pass or the unspoiled beauty of Maligne Lake in Jasper National Park, all are within a pleasant drive of the international gateway cities of Calgary and Edmonton. "It's stunning, the majesty of the Canadian Rockies," says Dan Bell, owner of Upper Bow Fly Fishing in Banff, which is in Banff National Park. "It's a pleasant distraction to focus on the fishing when you have so much spectacular scenery." But a tug on the line will refocus even the most awestruck. While catch-and-release has been the rule in Alberta's rivers and streams in recent years, the measure has dramatically increased the size of available fish. The average size is 30 centimetres, but fish now get as big as 45 cms, though that's not as common, says Kim Straker, owner of Calgary-based Clearwater Adventures. "The bull trout get pretty big and very aggressive," he says, adding that the solitude in the Rockies and the quality of fishing is what makes it so great. "I've fished quite a bit in Montana and there's more pressure there," he says. "Here, you don't deal with the crowds. The fishing in many instances is just as good and the scenery is at least as beautiful, if not more so." The streams and rivers in Alberta's Rockies are teeming with Westslope cutthroat, bull, rainbow, brown and brook trout as well as whitefish. Dolly Varden and splake can also be found in select lakes and rivers. The species vary on location but local guides will ensure each angler gets what he or she came for. 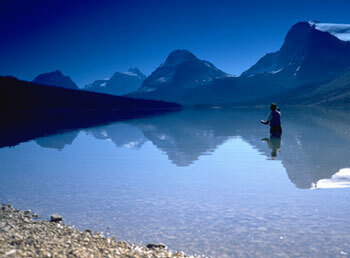 At the northern end of the Rockies, Barry Wood takes his clients fishing on Maligne Lake in Jasper National Park. Wood is owner and guide of Maligne Tours Limited. He takes his clients out on the lake when there's too much sediment in the rivers during the spring runoff. "The fishing's unbelievable," he says. "There's no people and no crowds. My clients enjoy the beauty and serenity of the mountains. I get people who want to catch fish and others who don't even care." Given the strong attraction of the environment, it seems like icing on the cake that the fishing is so good. Wood says that in five hours of fishing, he can catch as many as 40 fish. "If you go fishing in Montana, it's wall-to-wall fishermen," he says. "Here, you've got more diversity and the peaks are a lot more spectacular." Straker knows what he's talking about. For instance, the highway between Jasper and Banff is off-limits to commercial traffic and the highway is maintained just for tourism. It is one of the most spectacular drives on the planet and it's a region to which Dan Bell also takes his clients. In these rivers the fly-fishing is great, says Bell, whether it be streamer, nymphing or dry flying. He adds that while the Upper Bow is arguably the most beautiful stream in the world, other streams, like the Ram River, are quite isolated and beautiful and there are lots of big cutthroat and wild animals. Between Jasper and Banff National Park are countless streams and rivers, all isolated and protected within national park boundaries. There are also great rainbow, cutthroat and bull trout in Kananaskis Country (which is less than an hour's drive from Calgary), and southeast of Banff National Park. Alberta's Rockies run in one continuous spine from Jasper down to the Crowsnest Pass, near the U.S. border. Throughout the entire range, rivers and streams are plentiful and population sparse. The whole region is home to deer, waterfowl, ospreys, eagles, bears, moose, elk and a variety of other wildlife of all shapes and sizes. Heading south, the Rockies look different than Jasper, but they remain just as wild and spectacular. Crowsnest Pass, located in the southernmost Rockies, is situated in a windy valley just before the mountain range crosses the border into the United States. It's home to the Crowsnest, Old Man, Livingstone and Castle Rivers. While guides and guiding companies will help anglers find the solitude, scenery and fish they're looking for in the area's rivers and lakes, only the Angler's Ridge Bed & Breakfast offers women-only packages. Wendy Meerveld, owner and operator of Angler's Ridge, along with a little help from partner companies Saddle Mountain Ridge and Tread Softly, teaches her female clients to fly-fish. At day's end, there's yoga, meditation and Reiki, a spiritual-healing exercise. There's also emphasis on healthy eating and wellness living. "In three days the women reach total relaxation," says Meerveld. "We take someone from the city who's all hyped up and stressed and they go back utterly relaxed and wishing they could stay." Though Meerveld and her two business partners have only offered the program for one year, she says there's been lots of positive feedback. "Women think fishing is a man's sport, but they're catching on," she says. "When you're fly fishing, you have the river coming at you and its very tranquil." But Angler's Ridge B&B isn't just for women. As the name would suggest, it's one of the few accommodations that caters specifically to anglers. "I cater to the fly-fishermen," says Meerveld. "I pack them a lunch and if they want to rise at 5 a.m. then I make them breakfast at 5 a.m. We also give them tips because my husband and I are fly-fishermen. We know the areas really well, we tie flies and we can give them tips."